Poipu Shores Condo Unit 104C is a rare, fully oceanfront 2 story townhome, with two oceanfront lanais. 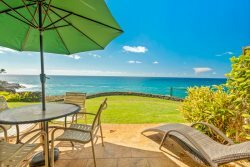 Rarer yet is the completely air conditioned environment, rare for Poipu Shores and very rare for oceanfront condo on the south shore of Kauai. This whole condo was recently upgraded and remodeled. It is tastefully decorated and enhanced with select materials to capture the tropical ambience of the island. Captivating views and crashing waves enhance the superb craftsmanship of the tropical interior. Fine details abound in this island home, from lighting to art and furnishings. Trade winds are abundant in this home, bringing in the cleanest air on the planet as you rejuvenate in this special location. One of the largest homes in the resort, you will enjoy over 1200 square feet of interior living space and over 100 sq. ft. of lanai living. Carefree and comfortable living abounds, giving all the creature comforts of home. A sleeper sofa is included for the extra guests with you. Fine details and comfortable furnishings encourage you to relax and refresh yourself. A desk is provided for your comfort with free condo-wide WiFi included. Ceiling fans as well as free standing fans for your comfort. A flat screen tv with a dvd player. The pillow top tile throughout the condo is naturally elegant. A fully equipped, quality kitchen allows for the ease of dining in with better views than most restaurants. The thick granite counters are set off by stainless steel top shelf appliances and graceful lighting. The gorgeous glass tile backsplashes are exquisite and echo the colors of the ocean and sky. Rich tropical koa wood cabinets are a magnificent element of the kitchen. Dine at the bar, dining table or on the lanai. A few steps from your front door you will find a BBQ area with 2 grills for your grilling pleasure. You can be as creative as you desire, a culinary delight or a picnic lunch to enjoy as you explore the island. Unusually intimate, the master suite also includes your own private oceanfront lanai. The stars are dazzling at night, you will be thrilled with how many you can see and how close they seem from your private perch above the Pacific ocean. Enjoy some solitude time while still having your family or friends nearby. The lush tropic décor is restful and the serene ambiance is just what is needed. The natural stone shower and vanity is exquisite. The master bedroom is spacious and pleasing to the senses with a king sized bed for your comfort. No second class in this en-suite bedroom, as quality continues in every aspect of the condo. From furnishings to architectural details, your comfort is guaranteed. Pleasant colors and finishes create a feeling of restfulness and comfort, while the en-suite bathroom is gracious and elegant with a beautiful natural stone vanity and shower. Quality abounds and you will be delighted with this serene location. Trade winds cool and soothe this pleasing room. Delight in the artwork and details. To accommodate more guests we have an Aero (inflatable) bed as well. A half bath on the main floor has the same detail to quality that the entire condo enjoys. A washer and dryer are installed for your convenience. Beach towels, beach chairs and cooler are just a few of the details that are included in this special home. I wish we could have stayed longer! Thank you for supplying every amenity . We would love to come during the winter to whale watch ! Patricia was great to deal with. Flexible to our needs and very responsive. Excellent experience and would highly recommend. Had a great time in Poipu Shores 104c. The view was unbelievable and the pool was incredible. The condo was equipped with everything we needed from snorkel gear to soap to paper goods to kitchen supplies. Best equipped unit we have ever rented. Couldn't have asked for anything more. Would definitely rent this unit again. All in all one of the best vacation rental experiences we have had. This property, as well as the staff made our vacation hassle-free. It was a comfortable, updated home to return to at the end of the day. We will DEFINITELY request 104C again in the future! Thank you! A $1000 initial payment is required to hold your reservation. A signed Reservation Summary is required to validate your stay with us. Final payments are due 2 months prior to your stay. A check, money order or bank transfer is preferable, but a credit card can be used with a 3% convenience fee. Visa and Master Card.